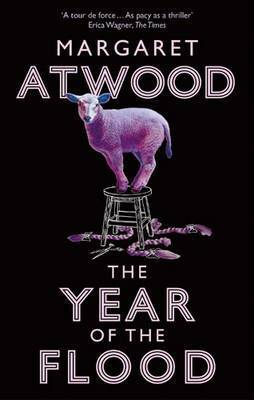 By turns dark, tender, violent, thoughtful, and uneasily hilarious, "The Year of the Flood" is Atwood at her most brilliant and inventive. I stole my copy of this book from my local thrift store, because expecting someone to pay a whole twenty-five cents for a pristine copy of a used book (seriously the spine isn't even broken) is just asking way too much. I don't even care that twenty-five cents is like three percent of the purchase price, it's still too much. This book took me back to my youth and the year of the flood that I lived through. I remember that year, I mean, I don't remember exactly which year it was, but I remember the flood. It wasn't the '51 flood, no, I wasn't even the beginning of a twinkle in my daddy's eye in '51, this flood was much later and apparently far less severe, but I think advancements in technology between the 50's and 90's probably largely account for the difference in perception there. Anyway, back to the flood. School was cancelled during the flood. The river waters had risen so high that the bridge between Cottonwood and Strong City was impassable, cutting the school district in half-ish. The waterfall had disappeared, slight ripples in the water were the only thing that indicated where the dam was located. That week was probably the best week of the school year for most of my classmates. If times had been different, life back then would probably have been much like what is described in The Year of the Flood. We would have been fighting for survival against crazy cross-breeds that both want to be our best friends forever and tear us limb from limb. Survival of the fittest would have been the name of the game, and I would have been a goner. Thank goodness, times were what they were and there was just a little bit of water damage to deal with. 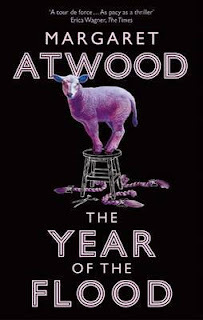 I give The Year of the Flood 4 out of 5 stars. If you would like to read some legitimate reviews of The Year of the Flood, just click on any of the following links.